Learn Ghanaian dance from world-renowned performers Gloria Nyame and Richard Dwomoh. Brother Richard and Sister Gloria will lead participants in a 3-part series that explores techniques and dave styles from several of Ghana’s many ethnic groups. 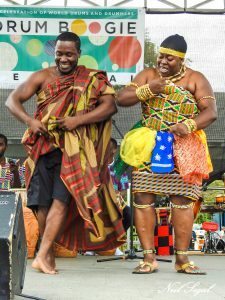 Those who take part in the workshops will have the opportunity to perform alongside the professional NY Ghanaian Drum and Dance Unity Enseamble in an outdoor concert held at Mount Vernon’s City Hall Plaza. All are welcome! Individuals with previous experience in West African dance are strongly encouraged to attend. For more information, please contact Aaron Paige, apaige[email protected] or 914.428.4220, ext. 329. For information about the performance, please click here. This program is part of ArtsWestchester Folk Arts Program, made possible by the New York State Council on the Arts.